What are 3 key figures in contemporary dance? I have to say that your question is hard to answer, because contemporary dance has mostly been an art of collective creation and cooperation. More than isolated figures working on their ideas, contemporary dance has had trends and groups of artists that contribute together to the new discoveries and paths. From the point of view of dance history, you could say that Merce Cunningham is indeed a key figure for contemporary dance. 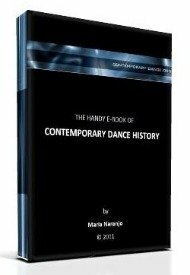 In fact, many dance historians consider him as the artist that marks the end of the modern dance period and the beginning of the contemporary dance time. This is because he radically deconstructs almost all of the aesthetical principles with which modern dancers had worked till the time. After him, you could say that Steve Paxton is another one of the key figures, because he is recognized as the founder and first developer of contact improvisation, which is one of the most important new faces of contemporary dance since the era of modern dance. Though, I believe that what I told you above applies for the case of Steve Paxton because it is inside the ambience and collaboration of The Judson Church Dance Theater and The Grand Union that his ideas emerge and grow. So, even if Steve Paxton is the most renowned figure, I believe the names of all the dancers of that trend make part of the introduction of contact improvisation to the evolution of dance (Simone Forti, Yvonne Rainer, David Gordon, Trisha Brown or Nancy Stark for example). In Europe, there's the so called New Dance trend, with lots of artists in Belgium, Holland, France and the surrounding countries. They might not have one figure that is more mentioned than others, but they are extremely important as a trend or collective spirit for contemporary dance in the rest of the world. Maybe, from the point of view of the scenic proposal, Pina Bausch is a renowned reference, for introducing new methods and aesthetical approaches. Though, you have to consider that she was an artist that worked in the frontiers of theater, ballet and contemporary dance, so I don't know if you would like to include her in such a categorization. Nowadays there are famous people. But that does not necessarily mean that they are key figures. The 'title of key figure' is something that is usually attributed by history. So I guess that we have to wait for a few decades maybe, to know which of those famous of today will be considered as the generators of the biggest changes. I hope this is what you are looking for, but still don't hesitate to write back if you wish to ask again.